Ahh!. Time to relax! The warmth of the suns rays on a browning skin, the soft whispering of the wind in the trees or the crackle of fire in the hearth as the rain falls gently. 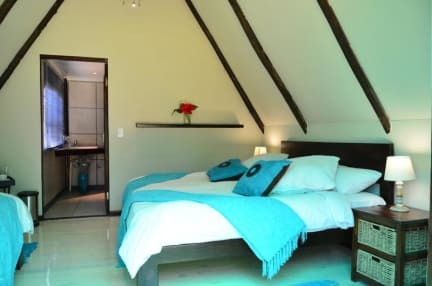 Surrounded by the fantastic mountains and forested gorges of the Tsitsikamma, this gem of an establishment is situated in the quaint Storms River Village. The first of its kind, the cozy little Tube 'n Axe Backpackers Lodge boasts a range of comfortable and affordable accommodation with inviting double rooms, an elevated bush camp, large dorm beds and plenty of secluded camp sites. The Lodge offers a full al le Carte menu, self-catering and braai facilities. A vibey African bush style entertainment and bar area equipped with big screen satellite TV, pool table, table soccer and bungee chords for those about to jump, will ensure that nights and sports afternoons are action-packed! Star Gazers can nestle up in a quiet garden hammock while the gumboots kick up the African dust around the bonfire pit. I loved this place! Great atmosphere, comfy beds, bonfire and music at night and an open air shower and eco toilet. Wish I could've stayed longer! Nice hostel, friendly staff. Did not really like the vibe. It was more of a pit stop so it didn’t feel uber friendly. Had a hard time socializing, regardless stayed in a dorm. It was really small but had a beautiful outdoor shower, and a cool compostable toilet. Better if you have a car to come and go as you please.